Back In The Gi » Blog Archive » Reflections on my (second) orange belt grading. Reflections on my (second) orange belt grading. The first two karate gradings in which I participated took place at McMaster University, when I was still training in Japanese Goju-ryu as a first-year undergraduate. They were rather mechanical affairs, with a series of stations set up around a gymnasium — one for basics, one for kata, one for sparring, etc. — and we simply rotated through to complete each component. 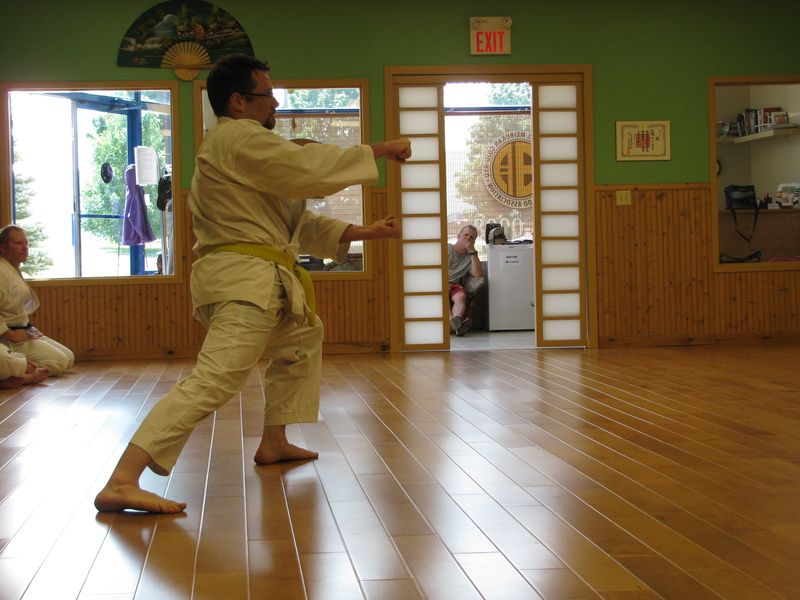 It wasn’t until the summer after my first year, when I began training in Okinawan (Jundokan) Goju-ryu, that I experienced a more personal and meaningful style of grading. 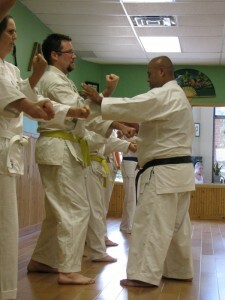 My green belt grading was very different from the two that preceded it. Only one thing was going on at a time, rather than passing through the martial arts equivalent of an assembly line. There was a lot more attention paid to each student, and Sensei knew each of us and how to challenge us. 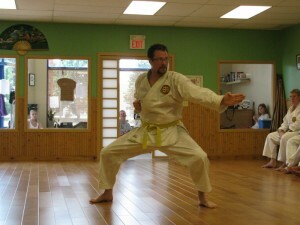 And, in addition to basic techniques and kata, we were expected to know some history of the art, to demonstrate at least basic knowledge of bunkai, and to perform various breakfalls and self-defense moves. It was a lot more intense, and I can remember both how nervous we all were beforehand and what a sense of personal achievement we felt when it was over. Working up the kyu ranks for the second time. I am glad to say that my second orange belt grading, which I completed this previous weekend, was both challenging and rewarding. 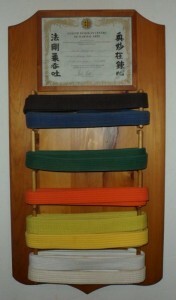 In many ways, it reminded me of the gradings I had from green belt and up in the past. What was different this time around wasn’t so much the grading itself, but me. Indeed, I am finding my perceptions of most aspects of karate training to be rather different this time. This reflects greater maturity on my part, certainly, and it is also because I now consider it within the context of other life experiences, especially with regard to my career in academia. And so, from this perspective, here are some reflections on the most recent grading. When I have PhD students preparing for their qualifying exam — an admittedly gruelling process in which they answer questions from multiple professors for 3 hours, which takes place about one year into their 3-5 year program — I point out to them that the “exam” actually has several objectives. The first, and most obvious, is to ensure that the student is cut out for continued PhD-level studies. People can and do fail the exam, and in some cases they choose a different career path as a result. However, this is only one reason that we undertake the procedure. Another, equally important one is to require students to think about the bigger picture in their discipline. They do not simply memorize trivia, they have to present plans for a research program. This is not the same thing as laying out the idea for a research project; a research program encompasses many projects and has both short- and long-term goals for an entire lab group. Students have research projects, but professors have research programs. We also want to make sure that the student understands the broader context of their field, rather than only knowing a lot about their specific study. Finally, we use the exam to test the boundaries of a student’s understanding of his or her research area and of science in general. If we find that a student knows plenty about a certain topic, we move on — there is no point dwelling on it. What we’re interested in is finding what they don’t know. This allows us to propose strategies for how any missing skills or knowledge can be acquired during the remainder of their PhD studies. The fact that faculty from other labs are involved in the exam is particularly useful here. So, a qualifying exam is not just a pass-fail test, it is also an exercise in evaluating broader skills that are not necessarily used day to day, a way to make sure that the student is developing a well-rounded understanding of their field and of scientific research as a whole, and a means of identifying and correcting any shortcomings early in the PhD program. So I believe it is with karate gradings. Yes, there is the element of testing and of moving to a higher rank upon completion of the test. But it is also about seeing how students perform under pressure, of pushing the boundaries of their endurance and abilities, of identifying areas that need particular attention, and of providing a marker along the path of a student’s training. In the latter sense, it is as much an initiation into the new rank as it is a test of proficiency in the techniques learned at the old rank. You made it through. Here’s your new rank. You’ve earned it. A karate grading has an added purpose that is not found in graduate-level academic exams and thesis defences, namely that it serves as a bonding exercise for participants. Going through a trial of mind and body together can bring people closer together. 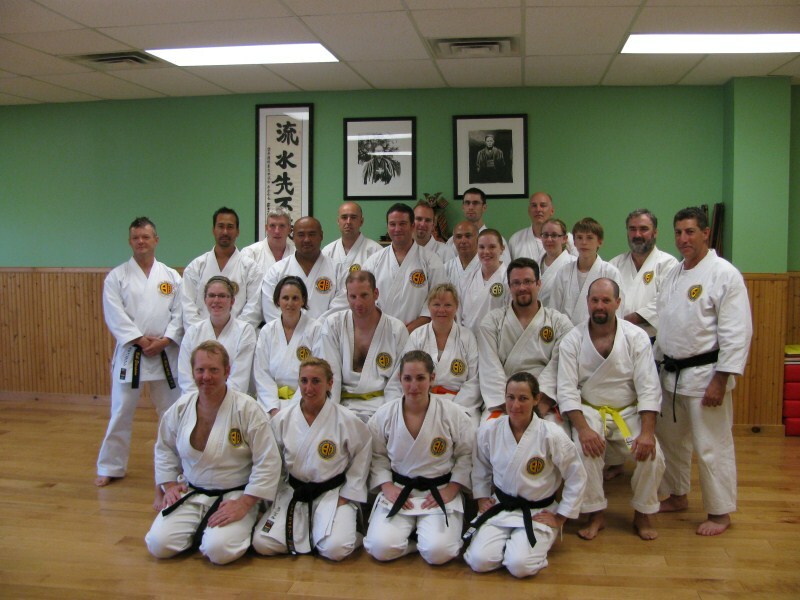 Likewise, having more senior students and black belts from other dojos come to participate in the grading and to offer their support in subtle ways (a pat on the back here, a “you’re doing great” there) can make students feel like they are part of a tight-knit group. 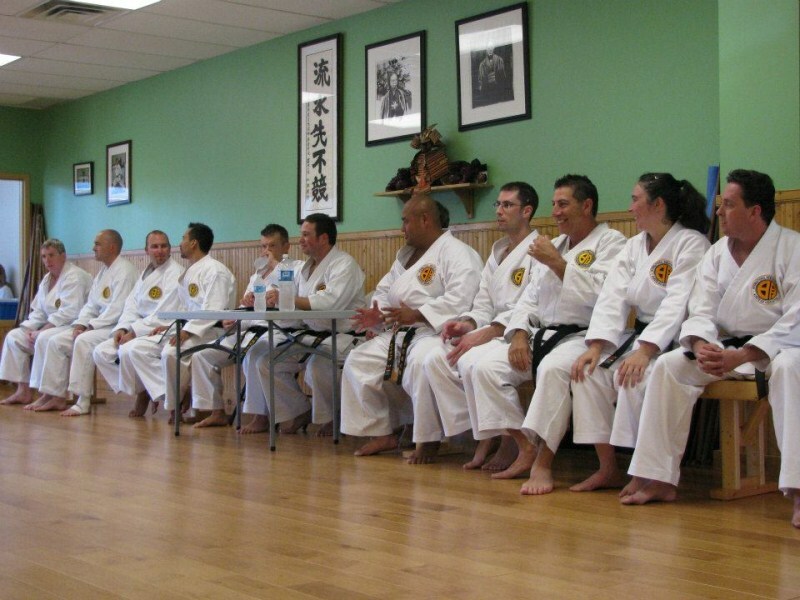 One of the major benefits of a formal grading is that it provides an opportunity to obtain feedback from an entire panel of black belts, some of whom come from other dojos. One thing I definitely noticed at this grading, and which I greatly appreciated, is that the black belts know their stuff. 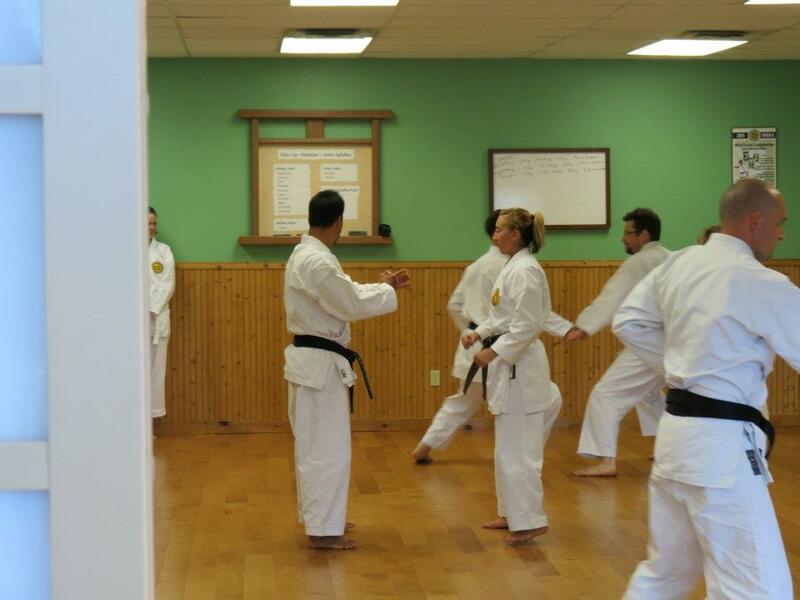 They were able to pick out errors both large and small in the kata and kumite performed by students at every rank, and — just as importantly — to provide constructive comments on how to fix those errors. Being able to identify problems and to offer specific solutions requires a great deal of knowledge, and it is gratifying to see that the higher ranked members of the dojo (and those from elsewhere within the organization) have gained this level of insight. Again, it’s encouraging because it means that the training we undertake as junior students is headed in the right direction. 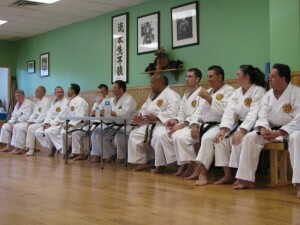 A panel of black belts: intimidating, sure, but also a fantastic source of constructive criticism. * When being tested with resistance to the punch, I need to keep rotating my fist and push but don’t lose control when hand released. * I need to tuck in my elbows more and pull my shoulders back. * My kicks need to be higher. In Meibukan Goju-ryu kata, the front kicks are high kicks, whereas they were middle kicks in my old school. I think this one may be about correcting some older muscle memory. * My middle punches should be slightly higher. * I need to work on getting the placement of my hands to be correct on the double punches. * On the kake uke block, there should be an open hand block that then turns over directly into the kake uke block. I had a tendency to bring the hand back in toward my centre line and then push it back outward. * I need to slow down a bit and really complete each individual technique, for example the double blocks and double shuto. * I had been trying t pull the foot off the ground while pushing on the knee, as though it were two separate moves being performed simultaneously. Some advice from panel members really helped me to clarify that I should be pushing inward on the ankle and outward on the knee, like a single sandwiching motion. This was a definite “a-ha!” moment for me. And, finally, there is a new mantra that seemed to emerge from the grading after various students completed their kata: LOWER AND SLOWER. As one panel member put it to several of us, if you think you’re going slowly, go slower. If you think your stances are low, go lower. And don’t forget to breathe! 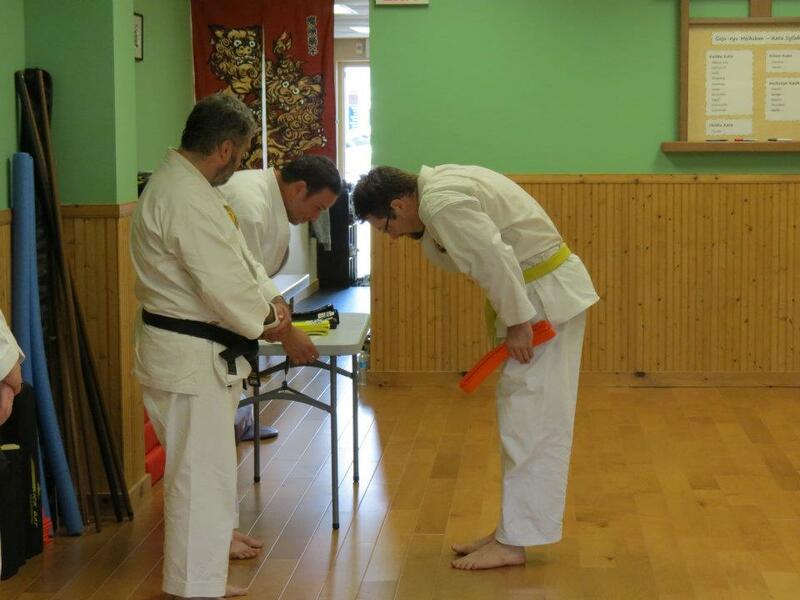 If you are familiar with the Meibukan syllabus, you may have noticed that Tenchi and the ippon kumite exercises are not actually requirements for an orange belt grading, though I had to perform them anyway. Well, here’s another thing about karate gradings: they vary. Not just from rank to rank, or from grading to grading, but even among students of the same rank grading on the same day. It is a mistake to go into a grading thinking that what is on the list is all that there will be. Senseis (and professors) have a tendency to tailor exams like this to each students, to test what they know (or think they know), not just the minimum requirements. It’s a sign that they know their students well and that they have confidence in the progress of their training thus far. So, knowing this, I made sure to go over Tenchi, Gekisai Ni, and Saifa kata in the lead-up to the grading. 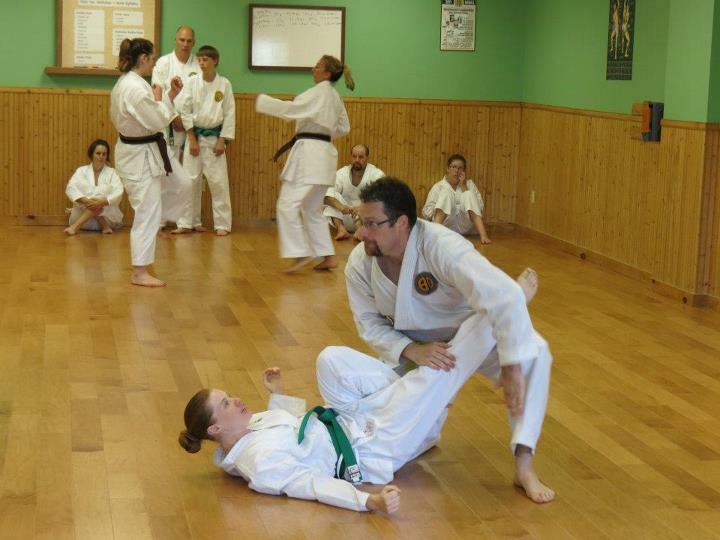 I also made sure I was comfortable with the basic execution of the Jo and Chu ippon kumite. 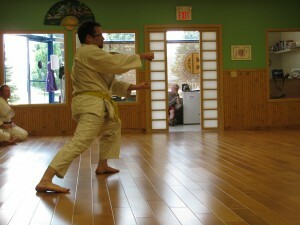 And I was not surprised when Sensei had me do five rounds of kakomi kumite rather than the two that were listed. In my view, it’s an honour to be asked to do more at a grading. It also provides an opportunity to receive additional corrections. You’ll notice that I learned some important things about both Tenchi and the ippon kumite by being made to perform them in front of the panel. This was the sixth formal grading in which I have participated, not counting various kids’ and adult gradings that I assisted with at my old dojo. 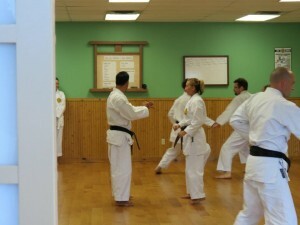 However, this was the first time that I had seen students grading for their black belts. In my old dojo, gradings were only conducted in-house up to brown belt; black belt gradings were held at a regional level in Toronto. 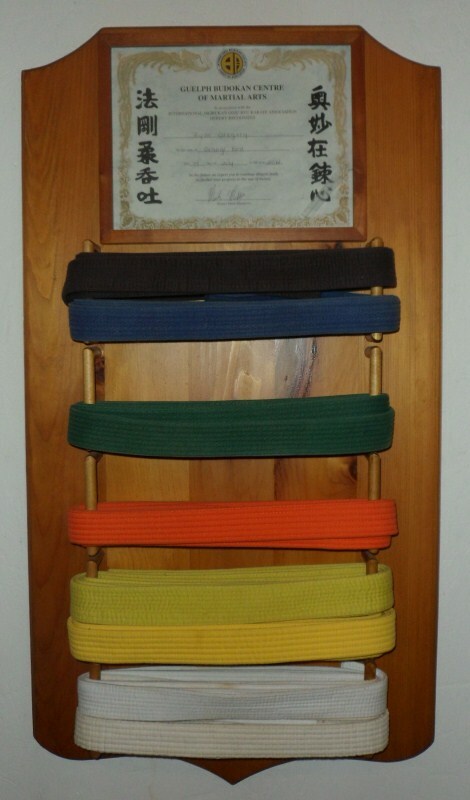 As a result, I never quite knew how a black belt grading might differ from what we did in our own dojo. Many of us concocted scary imaginary versions of what they must be like, which made the prospect seem pretty frightening. Having now been part of a grading that included three students passing to shodan and one to nidan, I can say definitively that the difference between their grading and mine was one of degree and not of kind. They did more kumite, more kata, and so on, and it was performed and evaluated at a much higher level, but it was not fundamentally different from what junior students also had to do. Of course, this is not meant to minimize the significance of earning a black belt in any way. The important point here is simply that there is a continuum all the way up the ranks. Time, practice, good teaching, and help from fellow students is what bridges the path from white belt to shodan and beyond — there is no magical leap from mudansha to yudansha. The difference is that black belts have stuck with it, worked very hard, and have cultivated a large amount of skill and knowledge along the way. It’s easy for a junior student to look at what a shodan grading involves and to recognize how far away he or she is from achieving that level of proficiency. I am sure this can be discouraging. However, seen from the perspective of a continuum, it’s actually very encouraging. No, we may not be able to do the things that the senior students can do. Yet. It reminds me of the old joke about whether the glass is half empty or half full: it depends on whether you’re emptying it or filling it. In karate, you’re filling it, and the glass is therefore half full and there is cause to be optimistic. With that in mind, I am already looking forward to my next grading.